Hair color is an expression of yourself. It can be an accessory with colorful highlighted streaks, highlighted, or a soft classic color. This is an artistic palette from which we draw from customizing the colors to suit your skin tone, your face shape and your life style. I have been fascinated with hair color, highlights, dimensional colors that can be arranged strategically throughout the hair to be an artistic visual delight for me. I get lost in creatively bringing out someone’s best features with a placed highlight foil or the play on depth to help someone look like they lost ten lbs. Hair color can give your spirits a boost because you look better and feel better. Hair color can make your hair feel better due to the consistency and makeup of the base of the color. For example, if your hair is super coarse and rebelliously frizzy, the moisturization can help restore the color and shine just from the conditioning within the color application. Some of the hair color creams are made from Avocoda Oils or Coconut Oils designed to moisturize and give shine to the hair shaft. Others are made from wheat proteins that give strength and durability to fine hair. We have carried other hair color lines from year to year that are suitably safe on double processed hair to prevent damage to the hair cuticle when it is so fragile. Double processed hair simply means that the natural or pre-color treated hair is lightened with a bleach or lightener than a lighter pastel color is deposited onto the hair to create the luscious luminious hair color you were looking for. This can mean full hilights with highlift blonding or bleaching and toning. We highly recommend that you always follow up within 3-4 weeks for maintenance at the scalp to keep your hair color fresh in tone. If the hair color tone starts to fade, just call the salon to have your color refreshed with a deposit only color formula that our stylists provide for you. Usually, we will use a color product that is a direct dye only without any developer. The developer is what makes the color stay much longer unless you have your hair colored week after week then it will continue to deposit causing a band or just over depositing in the actual hair. Glazes and color balances are hair color products that deposit only. 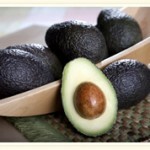 Very gentle and provide the missing pigments that have faded out from appointment to appointment. We normally recommend that you have your color balance done either every appointment or every other to maintain the color freshness as though you had it done the first time. As professionals trained in the industry, our Indulge hair stylists are specifically trained to talk to you about the best products to use on your hair giving you the best results. You actually have choices in regards to your hair textures and ends results while our staff works with you to give you those options throughout our consultation. 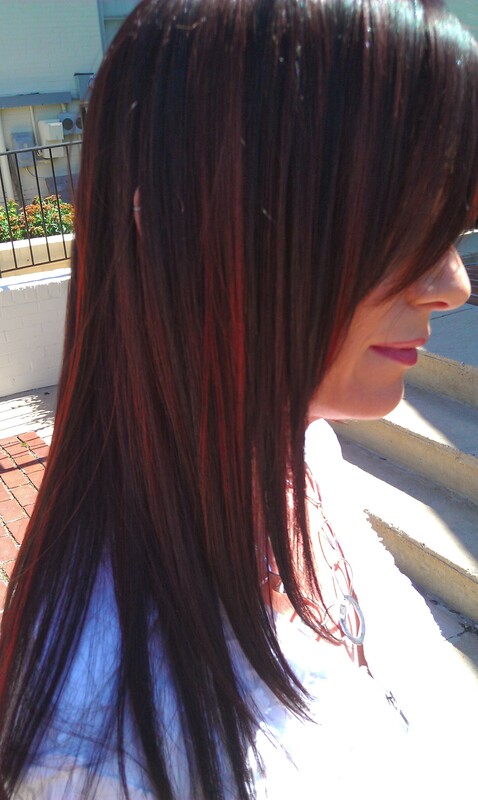 Hair color can be done on real human hair extensions. 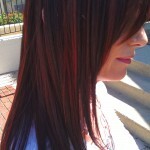 It is a myth to think that you cannot color hair extensions. Synthetic hair extensions will not hold color nor can it withstand intense heat or they will melt. All of our natural human hair extensions are able to to be colored direct dyes and/or permanent hair color dyes. We guarantee our work as long as you have your hair color done within our salon. The rinsing to remove the color that could have seeped around the hair extension bonds is critical for long term wear. We never recommend that you allow your natural hair extensions out in the intensive direct sun to prevent color from fading.